Anyone that has known me long enough for me to start chattering their ear off about video games knows that I have been a huge fan of the Sims franchise since I was ten years old (would've been earlier but the day before my brother promised to lend me his game disc and show me how it worked, one of our cousins sat on it while they were all hanging out in his room - years later I still suspect there's more to that story...). 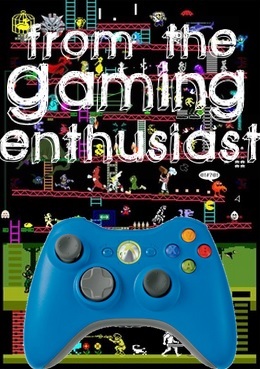 I've played the game since Sims 1 and excitedly purchased and installed every expansion pack and almost every stuff pack that has ever been released by EA and Maxis who produce the Sims titles. It took me until the first expansion pack for The Sims 4 was released for me to get genuinely excited about all the potential Sims 4 held that went beyond its predecessors - and with the newest Game Pack, Sims 4 Vampires, they have gone above and beyond my expectations! This newest game pack not only brings the first occult series into The Sims 4 (discounting Aliens - they're not so much occult as they are our neighbors that live in the sky ((or, y'know, right next door, hiding behind human skin)). ), but the pack is chock full of new items in CAS (Create-A-Sim), Build & Buy mode, and it even presents fellow Simmers with a whole new world to explore called Forgotten Hollow. But we all know that getting to play as and interact with other vampires is where the real fun starts with this pack, and that's where I thought I'd focus on with this post. These are a couple of Sims I made to try out the new game pack with, and I'll give you a quick introduction. This is Ebony MacHale, and Erik Waters. The two of them met in the metropolitan city of San Myshuno, where it didn't take long for Ebony to figure out that Erik is a vampire. Ebony is an ordinary sim, but she has grown up around vampires her entire life, though it was never a lifestyle she chose for herself. Despite how the two of them could be incredibly stubborn, and neither were really the monogamous type to begin with, they eventually ended up falling in love with one another. I apologize if this is too much story, I based these two sims off two roleplay characters that I used to love plotting with! So anyway, long story short, Ebony has come to the decision that she would like to live an eternal life with Erik, but to do that, she needs to be turned into a vampire. Erik can't actually do that himself, because he swore an oath to the vampire that sired him (and because vampires in the pack can't turn Sims into vampires right off the bat (no pun intended); it's a power they have to unlock). So, they actually moved temporarily to a house in Forgotten Hollow so Ebony could transition into a vampire in peace, and so they could pay a visit to the ancient vampire, Vlad. Erik introduced Vlad to his girlfriend Ebony, and after building up a friendship with him (this is a requirement before you can ask a vampire with the unlocked ability to turn your sim into a vampire), she made the request of Vlad that he might turn her. He agreed, and the process started by Vlad taking a small drink from Ebony. The last part of the process was for Vlad to make a cut on his wrist with his fangs and to get Ebony to drink some of his blood, and she did what she was told. From there, it takes three sim says until your sim is turned into a vampire. That's right, 3 Sim Days. But don't worry, like I did with Erik, you can create vampires right-off-the-bat from CAS. Now I'll focus on Erik a bit, so you can learn a bit about what vampires can actually do in this new pack. 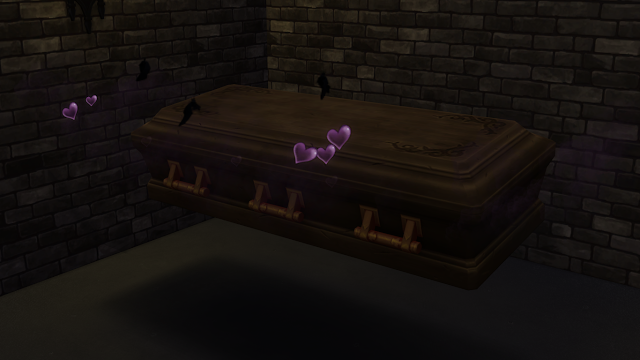 When vampires are feeling thirsty, they are in need of "plasma" - that's Sims's talk for blood, for they can keep their T for Teen rating :P In previous Sims games, you had to work hard to earn a relationship with sims and ask if you could drink from them, which was always a headache. 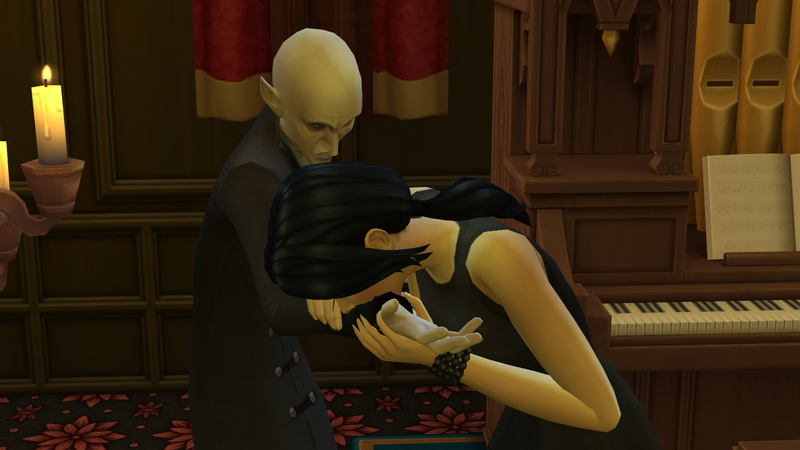 Now, from the moment you're a vampire, you have the ability to compel regular sims, and you can take either a small or a deep drink from them. 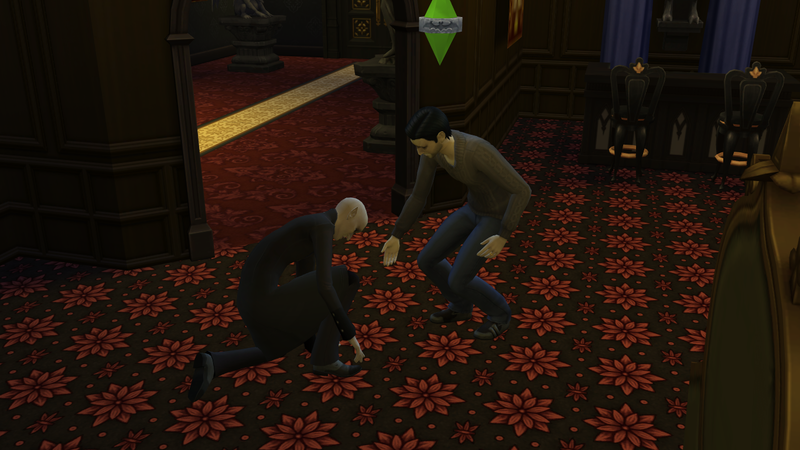 Don't worry, it's impossible to kill sims from taking their blood - but a sim will pass out right there on the ground after a deep drink, and any time after compelling a sim, they'll lose a bit of their relationship with you. Also, there's never a 100% guarantee that your vampiric magic's gonna work, so your meal could very well share their head at you and just walk away at the end of it all. Let's talk vampire powers! Whenever you are using your vampire powers, researching vampire history, doing things like sparring or dueling with other vampires or any of the new socials that have a little bat next to them, you're gaining more vampire experience, which is not only going to help you grow to higher levels as a vampire, but it's also going to earn you more Power Points, which you can earn on all these different powers that you see in the picture above. These powers will allow you to do things like turn into a bat, move at super speeds, expend less vampire energy any time you use your powers, you can even become immune to the sun! But for all these wicked powers you gain, eventually you're going to have to take on weakness as well. Perhaps you're someone that possess an overwhelming anxiety about the sun, even when you're safe indoors. Or maybe you throw up whenever you eat human food. Or maybe you just have a case of uncontrollable hissing. The higher level you reach as a vampires, the more powers - and weaknesses - you unlock. And would you believe, the first time Erik dueled Vlad as a fledgling vampire, ERIK WON! I was so proud of him! Figured I had to prove it with a picture. Should also mention that the Sims 4 Vampires came with a couple new Aspirations. Ebony's life's aspirations is to be a Grand Master - she was to learn everything that she can in the Vampire Knowledge Skill, and she wants to be mentored by other vampires who are of a higher rank than her. 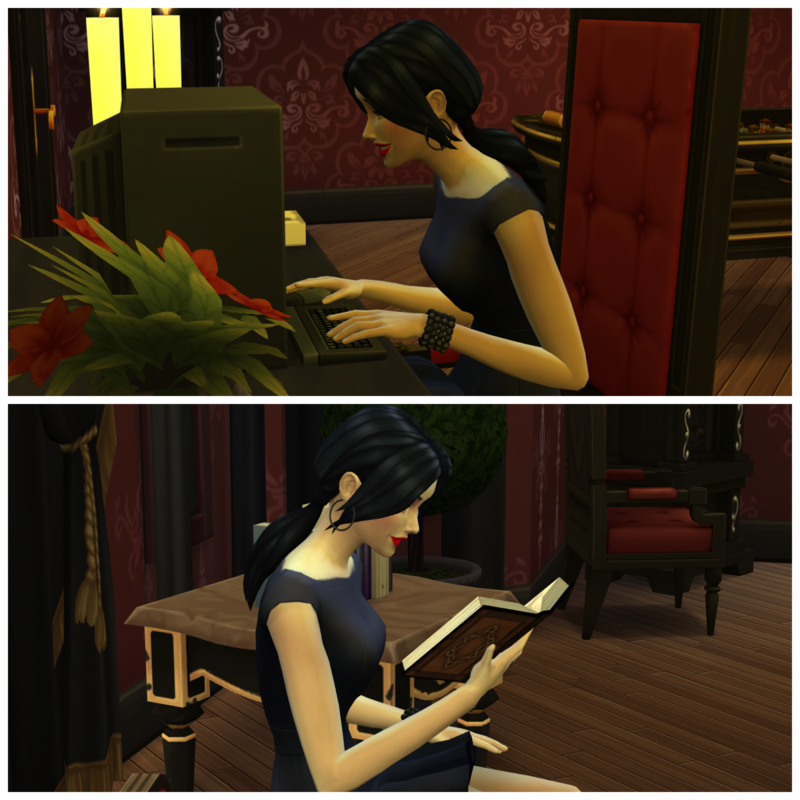 Even before her transformation into a vampire is complete, she's been working hard at her research and really hitting the books. After 3 whole Sim days, the time finally came for Ebony's transformation. I did my best to get photographs of the process so you guys could get an idea of what it looks like. I would have gotten a picture of her initial dark form, but... it involved her wearing a cowboy hat, so, no thanks. I immediately headed to a dresser to change up how her dark form looked a bit. 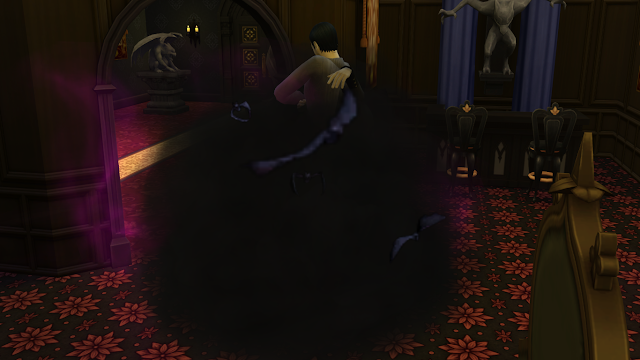 In case you didn't know, vampire sims have the option to have a dark form, which becomes visible when vampires are feeding, when their thirst gets low, when their sparring or dueling, etc. But this is only optional; if your sim isn't interested in blending in with society at all, they can look like a scary, gruesome vampire 24/7, and the design guru's at EA have added a ton of details to make your vampires as hellish as you could possibly imagine. In case you were wondering, this is what Ebony's dark form looks like. I wanted to go with something more alluring than scary, because it fits more with Ebony's personality. Let me know if you liked hearing a general overview about the Sims 4 Vampires from me! 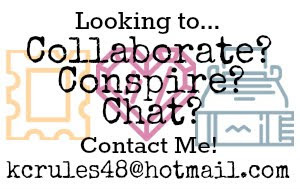 Also, let me know in the comments or on Twitter @KacieCruise if you'd like to see more Sims-related content on this blog, whether it's game-related or story-related because I'm have fun providing you guys with either one! Keep me posted!